What is the difference between steel toe and composite toe? All kinds of shoes have their own purpose. It might be to impress, to support, and to protect. With all the comforts that shoes can give to us, sometimes, we didn’t matter how it’s made and what are the materials it’s made from. Not all of us are ﻿shoe experts﻿ and some of us don’t even think that there are purposes on the materials on every pair of shoes that has made of. Take for example on the toe part of the shoes. It is unknown for some people that beneath the toe part of it lie the materials that serve as protectors of our feet. And two common materials that made in the toe part that stands out are steel and composite. Then we should know that there is a real difference between steel toe and composite toe right? So, how can we know it? Is it essential? Let’s find out. No matter what kind of material is made from, but the common functionality of toe box is to protect our feet from a sudden bump of force and the most affected to the force is our toes which will receive most of the damage. Without the proper materials for the toe box, it would go to be a disaster. This would also serve to let our toes breathe and lie in comfort as it freely wiggles inside the shoes which are a must for our feet to relax even in the midst of time pressure. So in terms of feet protection, which do you think is the best between steel toe and composite toe? Although both have the same goal to protect, you may want to know the difference of the two for a referral for you to know which type of toe box will serve your purpose and it all depends on the type of industry you are working for. Steel toes box is said to be the sought after kind of toe box for past folks even today. It’s simply a classic kind of material to consider for a shoe toe box! Composite toe is somewhat an opposite type of steel toe. As the time goes by, steel toe is combated with a rivalry when it comes to choosing the right kind of work boots and an innovation that works out for millennial working people. When it comes to the raging aspect of industry norm, it has become an item that quickly buried the golden days of steel toe boots. The following difference will be revealed. Based on the name suggests, this toe box is really made from steel, a heavy duty steel to be exact. This tough steel covering hinders anything or any object to fall directly on your feet and certainly prevents compression. Along with the materials lies a puncture protection, shatter proof but tend to cost less, how good is that? 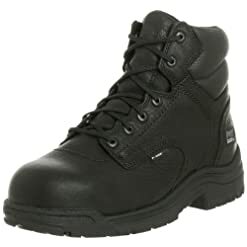 Unlike steel toe, this definitely a non -metal material which is made up of Kevlar, fiber, carbon, fiberglass, or plastic. It is a versatile material for it allows our feet to work in heat or low temperatures. Thus, it doesn’t cool down or heat up, unlike steel toe. And that would be a great convenience for the workers because it withstands them in any type of working condition even moved them freely. Although much heavier than composite but it’s safety caps give a more flat protection. It hands more on straight impact and protection resistance in every difficult situation and no matter how rough your kind of work is. This type of toe box is the suitable and most chosen option of construction workers, engineers, electrician, and other types of the workforce who face possible the severity of foot impact in their job and the environment. ​It actually passes the ideal standard but when it comes to impact and compression, it can’t take as much, unlike steel toe. And possibly, a foot injury is likely to happen and the boots have to be replaced instantly for security reasons. Although it has much resilience and hides physical damage, tests have been conducted that during subsequent impact, they can be less resistant.It has to be thicker and more bulbous to make them test to the same ASTM standard. It features a maximum protection for your toes because of the hardened steel material that resists a drop force. But prepare to be annoyed on some metal detectors for it can easily detect an alarm than any type of material of your toe box. It actually passes the ideal standard but when it comes to impact and compression, it can’t take as much, unlike steel toe. And possibly, a foot injury is likely to happen and the boots have to be replaced instantly for security reasons. Although it has much resilience and hides physical damage, tests have been conducted that during subsequent impact, they can be less resistant. But when it is more advantage when it comes to electrical resistance because the material is actually not a conductor of electricity, unlike steel toe. That is why; it is much preferred for electricians who regularly work with live wires. How to look for the Best Steel Toe or Composite Toe for Work boots? There are actually things to consider when looking for a steel toe or composite toes work boots. You have to know that once you purchase a steel toe pair of working boots, your decision must coincide with the nature of your job. 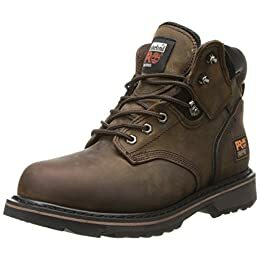 If you are into tough working conditions like engineers, construction workers or any workers which are prone to falling of objects then, this type of toe box is good for you.Timberland PRO Men's Pitboss 6" Steel-Toe Bo﻿ot is one of the best choices for you. A good steel toe work boots have to have good ankle support as well and make sure you are comfortable and you are not prone to feet sweating. A good steel toe box has wider toe box which is vital for your feet to work things out. It should be roomier and snugly. A good composite toe work boots have complied with safety standards and work best with the nature of your job.If you want to have a pair of commposite boots you can see my recomment.It's Timberland PRO 6" TiTAN Composite Safety-Toe Work Boot. The materials should be of high quality and must be durable. You must know if the shoes have break-in period or not. It can be crucial especially if you are in the middle of work. In every decision making of buying for good material for toe box, the main considering factor that you must always take into priority is your job. Safety is more expensive and should be most guaranteed. The right type of toe box of your shoes for your job is only a fraction of the whole level of prevention that you must do for yourself but it does give you an impact if you don’t fit the right type toe box material of your shoes. The next is, think how dangerous is your job? Are there any heavy equipment or possible objects that could fall or break-in? It’s not only the comfort and style that we are talking here but your protection. So the next time you buy for the right work boots, make sure to know the material of the toe box for you to determine your safety. Did you find my article helpful? Feel free to drop comments and share.